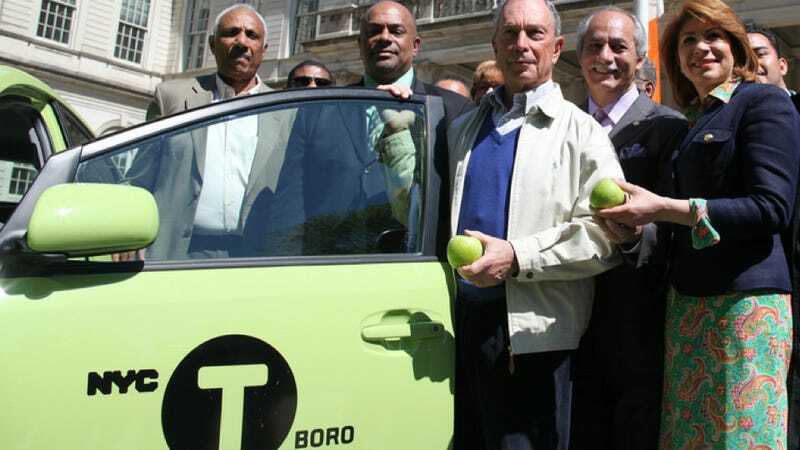 Why Is New York City's New Outer Borough Taxi This Sickly Shade Of Green? The main goal of the new "Boro Taxi" — cabs that'll respond to street hails in the vast parts of New York that aren't Manhattan (the outer boroughs) — is to make it distinct from the common yellow cab. In that respect, the recently unveiled cab color succeeds. It is distinctly not yellow. But why does it have to look like it just downed a plate of listeria-laced shawarma? The excuse being given is that all other colors are being used by city works, the police, emergency vehicles, and other cabs. Mayor Bloomberg calls the color "Apple Green," probably because he gets his apples from a tiny orchard in Austria or something. An expert in color theory interviewed by The New York Times called it "warm wasabi," which makes it sound even more remarkably unappealing. A random survey of people who saw it this morning expressed thoughts ranging from "sick" to "Eeeww gross." But the real reason it's a different color than yellow is because it'll require a completely different medallion than the current yellow taxis. A total of 18,000 permits will be available for the medallions which will be given out over the next three years, according to the Mayor's office. The one bit if good news is that licensees can choose any car they want, not just the Taxi of Tomorrow. Ford Raptor Boro Taxi anyone? Yes please!